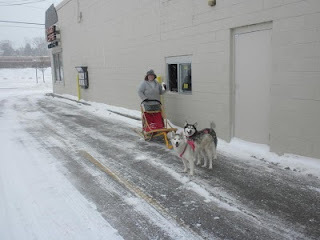 I took my dog sled out this morning to get my morning coffee at the drive-through, since we have been warned that road conditions are not good for driving. Thought you might like to see these photos. Carlos, the store manager at my favorite Portage franchise, suggested I submit them. My name is Lxxxxxx. My dogs are Pumpkin and Misha, and they sure love to run! I was glad to be able to get my morning coffee. Love it & love BIGGBY! Now that's dedication. What a great combo on a snow day - BIGGBY and Dog Sled! I am going to have to show this to my dog and let her know that she isn't living up to her full potential. I love the dedication of our customers (and their pets)!! Love it! I bet if people knew you had that kind of transportation then you would have gotten requests for rides to BIGGBY! Huskies love the snow and BIGGBY coffee. Hey Bob. Let's send this picture to Alaska. Maybe you could sell franchises to Eskimos.